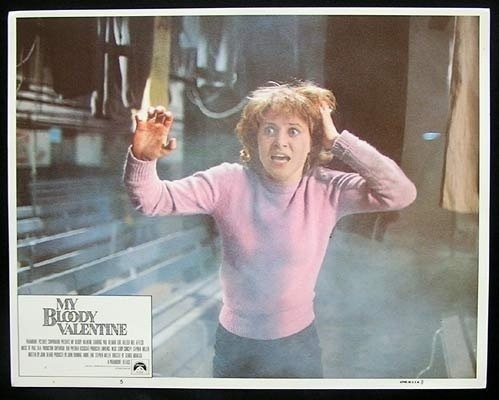 Released in 1981 My Bloody Valentine is considered by many to be one of the if not the best slasher film of the 80s and the film has retained its cult following over the years since its release. The slasher film while highly popular during the 80s was at the height of its success in 1980 and 1981 and the year MBV was released slasher films such as Halloween II, Friday the 13th Part 2, The Prowler and the Burning were released as well as Final Exam, Happy Birthday to Me and the spoof Student Bodies and the fact MBV was able to stand out is really saying something and if not mistaken Quentin Tarantino has called this his favorite slasher film. 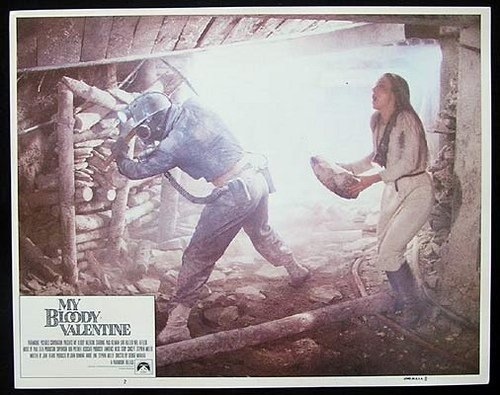 My Bloody Valentine upon its original release was slapped with an X-rating and was heavily edited to obtain the R-rating and the title should have been My Not So Bloody Valentine. There was roughly 3-minutes edited out (though the director claims there was more footage) and I think in many ways that helped keep the cult status as fans of the film for years wanted an uncut version, which finally happened in 2009. 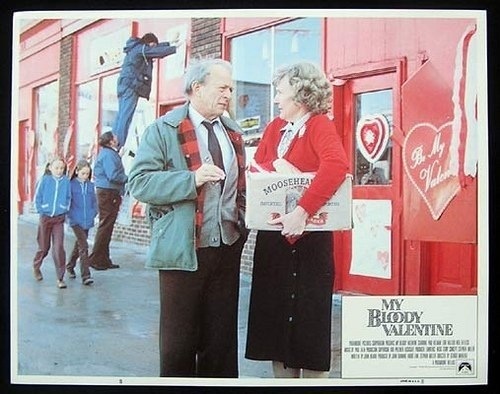 Back when MBV was released there were the moral crusaders and slasher films got it the worst with the MPAA and with the assignation of John Lennon in December of 1980 these films never really stood a chance with the MPAA it was hard enough before that and now even worse. 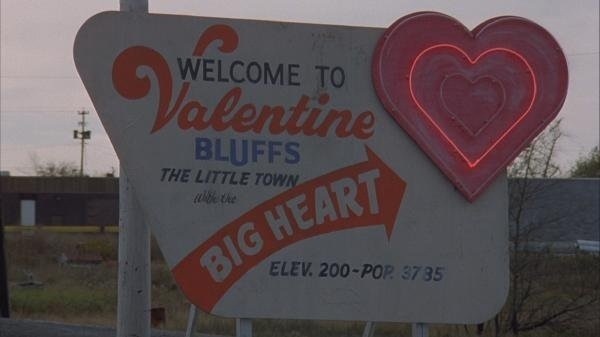 It’s been 20-years since Valentine’s Bluff has celebrated Valentine’s day after a series of murders by Harry Warden, but when festivities are being put together people around town are being killed. Has Harry Warden returned or something more sinister. 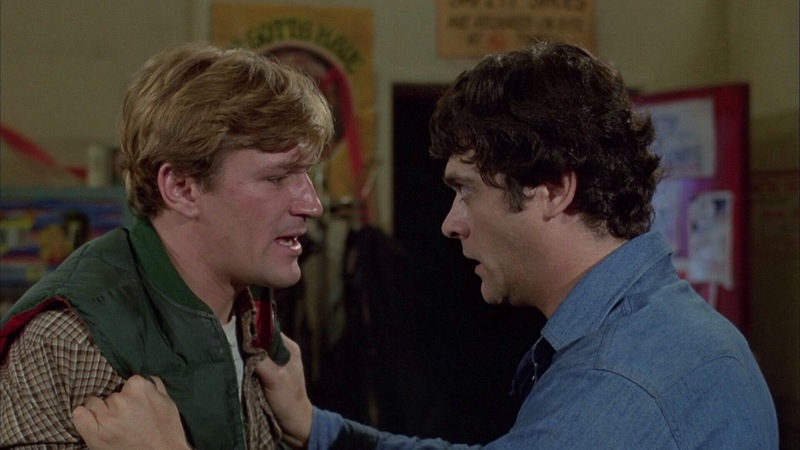 The screenplay by John Beaird is pretty much the standard slasher film of the 80s the only difference is instead of obnoxious teenagers we get obnoxious characters I assume in their 20s, but almost all of them act like teenagers. 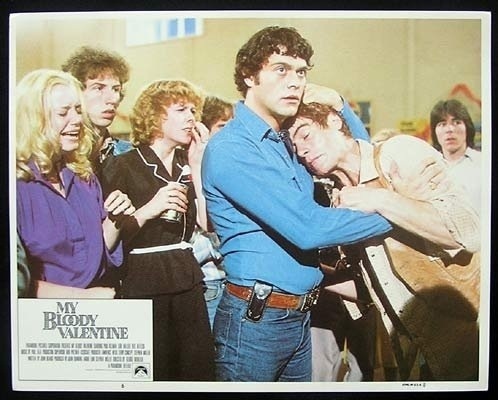 The script features many of the 80s slasher cliches such as the goofy prankster, the old man that warns of pending danger, the final girl and the final girls’ best friend. However John Beaird’s script never really feels like a cliche that isn’t to say it feels fresh and original, but despite having all the slasher movie staples it doesn’t feel like one long cliche. Characters while the typical slasher characters are however a fun bunch and a few of them were fairly likable and some even have a little depth though for the most part they’re here to pad the body count. We also get a love triangle thrown in for good mix and at times it does come across as a bit sappy, but it also adds a layer of depth to the plot and the characters of Sarah (Hallier) T.J. (Kelman) and Axel (Affleck) even if at times not only being sappy, but a little out of place, but it does serve its purpose. 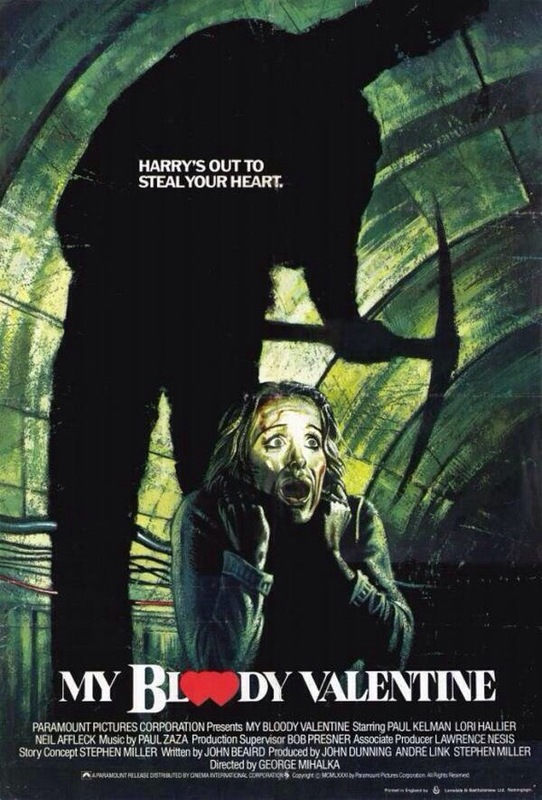 Overall the screenplay by John Beaird is the standard 80s slasher film from plot to characters, but yet the script never feels cliched and is better written than most 80s slasher films. Director George Mihalka crafts a stylish and eerie film that has plenty of atmosphere. The pacing is generally strong and while Mihalka doesn’t stray from slasher conventions its one of the stronger slasher films of the era since it’s as whole one of,the better made. 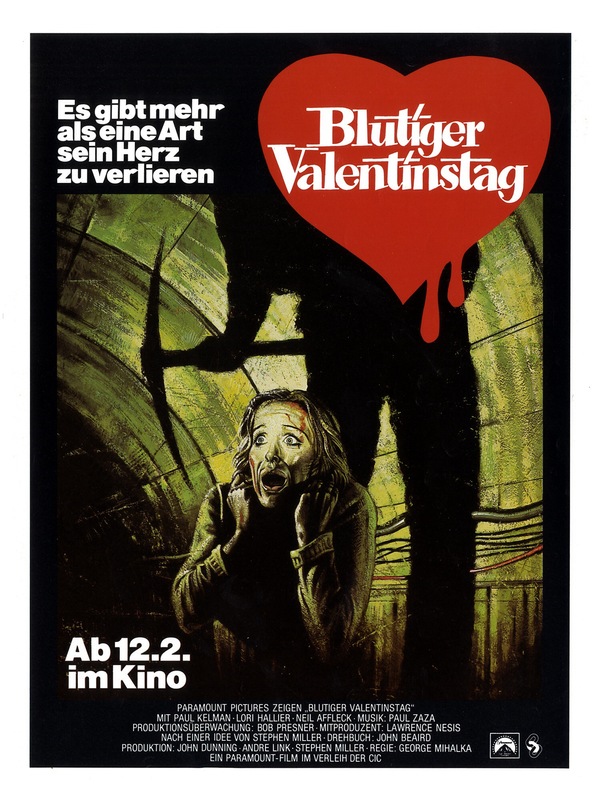 Mihalka gets great use of his locations as Valentine’s Bluff becomes a character in the film and the final act set in a mine added to the eerie atmosphere. 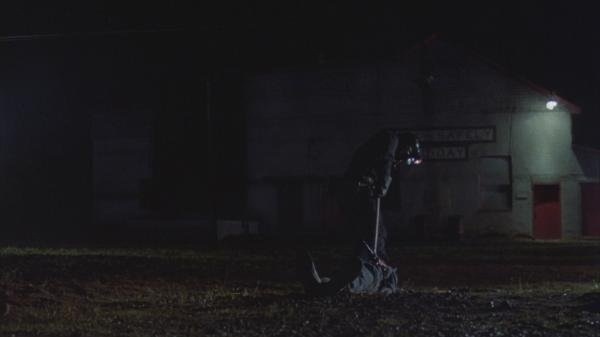 George Mihalka also crafts some excellent death scenes depending on which version you see. The R-rated cut is rather dry and obviously heavily edited whereas the uncut footage packs a punch, but regardless of which you see the death scenes are still creepy due to direction. Even when there isn’t any action, Mihalka still maintains some suspense and tension. The final act in the mines is a bit interesting in regards to its a very creepy setting and it’s loaded with atmosphere and we also get some great death scenes, but the pacing can also be a little slow in spots and perhaps could have used some editing, but with that said these scenes still play well thanks in part to the setting and generally creepy villain. 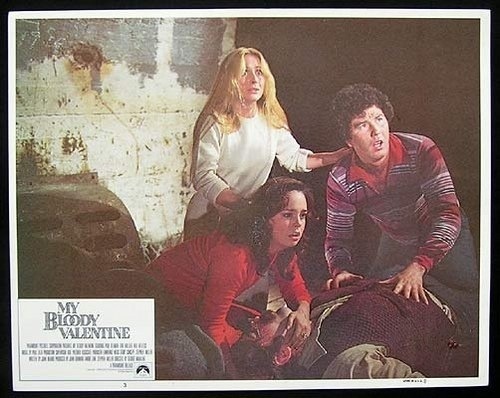 As a whole My Bloody Valentine is an excellent slasher film from a year that saw many of the best the sub-genre had to offer. 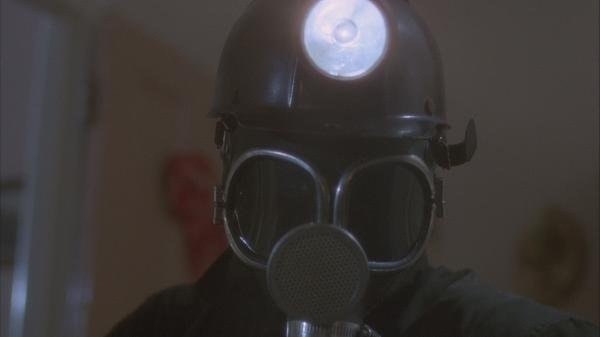 However with that said as much as I love MBV and the miner is one of my favorite killers as he’s quite creepy, which helps elevate the suspense when he’s on camera, but I wouldn’t rate MBV as highly as a lot of people do. Its hands down one of my favorite slasher films, but I’m not sure it would make my top 10 80s slasher films. 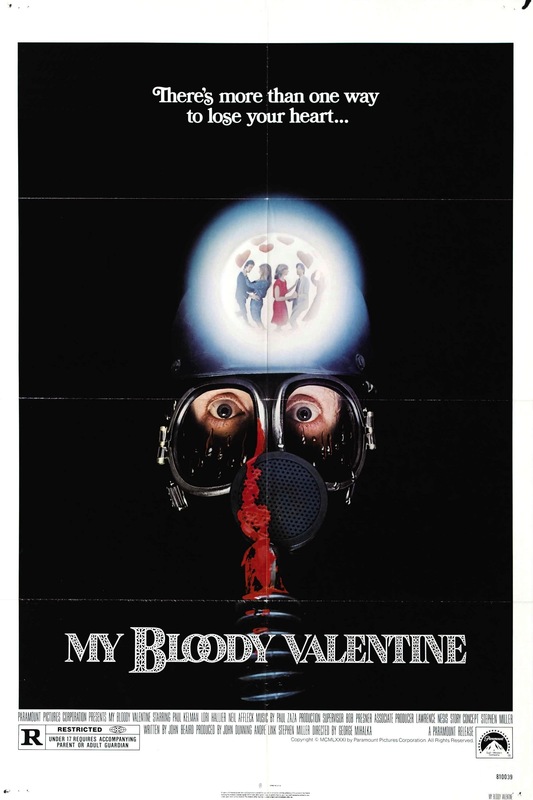 With that said MBV is quite eerie and one of the more suspenseful slasher films of the 80s and with some fun characters and a great use of location it’s not difficult to see why this is so beloved. 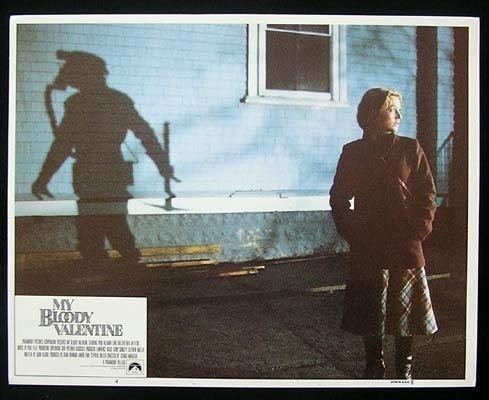 MBV would make an ideal double feature with the Prowler as both have a similar looking killer and nearly identical plot. 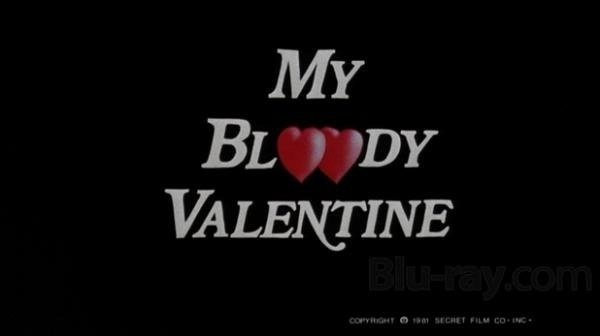 My Bloody Valentine was released uncut on DVD in Janiary of 2009 and than blu-ray in November of the same year. Originally the deleted gore scenes were only gonna be a special feature, but Lionsgate inserted them into the film and therefore the footage is quite rough looking and despite several months between the DVD and blu-ray the footage looks the same on blu-ray, which is a bit of a letdown, but hey it’s better than nothing. Lionsgate did a truly wonderful job with the HD presentation (of course not counting the added footage) and of all the 80s slasher films I’ve seen this might be the best HD transfer. Grain is present, but barley noticeable unless directly looking for it and even the night scenes look great. Colors pop right off the screen, which only makes me wish the deleted footage was fixed up. 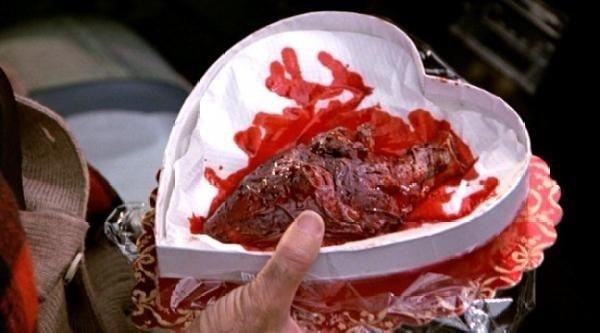 As for the added footage if you disliked the film in R-rated version I doubt the added gore, which sway your views, but fans of the film like myself will be very pleased as it adds a new dimension to the film.